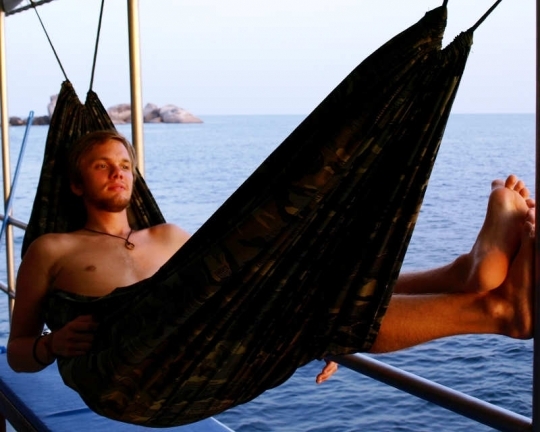 MV Oktavia is a 30 metre motor yacht that runs short Similans liveaboard diving trips. The standard trip is 5 nights but you can join for just 2 or 3 night via speedboat transfer. 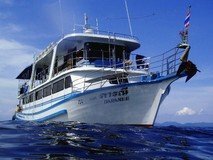 On board there can be up to 20 guests enjoying the best dive sites of the Andaman Sea, being looked after by 14 crew members. 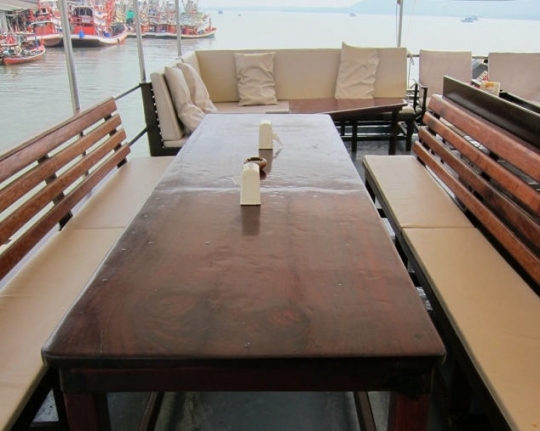 Popular with young international divers, various languages are spoken on board this Phuket liveaboard. 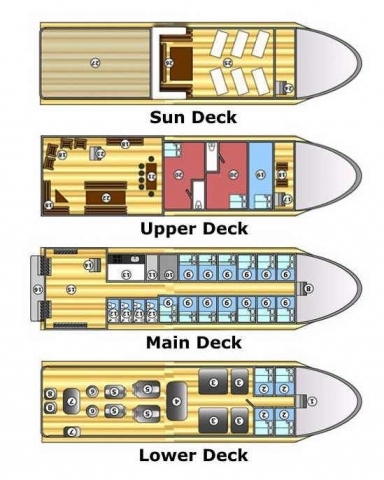 The guests mix in the open air saloon and dining area on the upper deck and on the sun-deck which is partially shaded. Known for its fun and laid-back atmosphere, the Oktavia also functions well as a dive boat with nitrox available and a dive deck with rinse tanks and fresh water showers. A range of PADI courses are also available to be taken on board. Cabins are mostly standard twin or double beds on the main deck with shared bathrooms, but there are 2 very large Master cabins on the upper deck which have en-suite bathrooms. 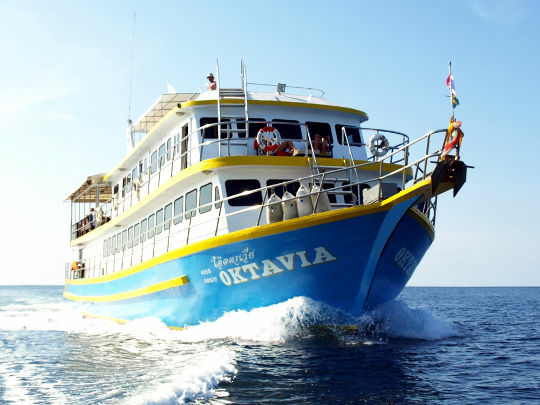 MV Oktavia is not a luxury liveaboard option but with plenty of comfortable seating space, a large sun deck, nitrox and more, it certainly has the features of a value-for-money Thailand diving cruise option within its price range. 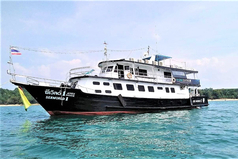 Cruise price per person includes: Cabin accommodation with air-conditioning, breakfast, lunch, dinner, snacks, drinking water, hot drinks, Khao Lak transfers to/from the boat (available for 2 and 5 night trips only), dives (as detailed in the trips above), experienced English-speaking divemaster(s) (4-5 divers per DM), tanks, weights and weightbelts. Cruise price per person excludes (mandatory, unless customer provides own): Scuba equipment (approx. 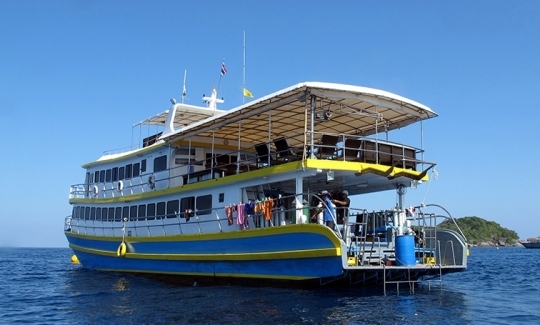 US$ 20 per day), Similan and Surin park fees at approximately US$ 6 per day, with an entry fee of US$ 16 per park. Unless otherwise stated, all the listed items need to be paid on arrival (cash only). 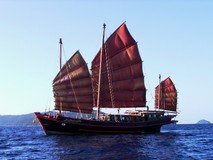 Optional extras: Phuket hotels/airport transfers to/from the boat, soft drinks, alcoholic drinks, nitrox fills for enriched air certified divers (US$ 7 per fill), diving computer, dive insurance, Master cabin surcharge (US$ 63 per day per person). Unless otherwise stated, all the listed items need to be paid on arrival. How to get there: Most MV Oktavia liveaboard trips depart in the afternoon from Khao Lak, while the shorter trips start with an early morning speedboat transfer to reach MV Oktavia when is already moored in the Similans. A transfer service from all hotels in Khao Lak is provided for 2 and 5 night trips. 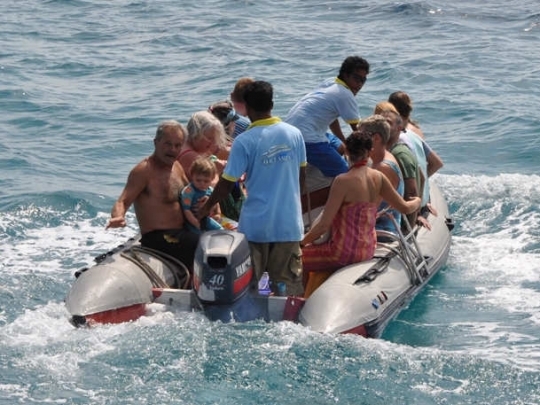 Transfers from all hotels in Phuket or Phuket Airport to and from the boat is provided at extra cost. For more information see our Thailand travel information section. The last dive of the cruise will be at around 14:30 hrs. Please wait at least 18 hours before flying after diving. 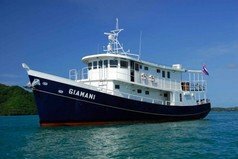 Non-diver rate: 25% off the published price (except 12.5% off the published price for 2 nights Similan Islands & Khao Lak itinerary). Single supplement (if you do not want to share accommodation): Add 33% to the published price of a standard cabin. Dive clubs and group discounts: Pay for at least 10 guests on the same cruise and receive a customised discount on the normal rates. Please check with us for more details. 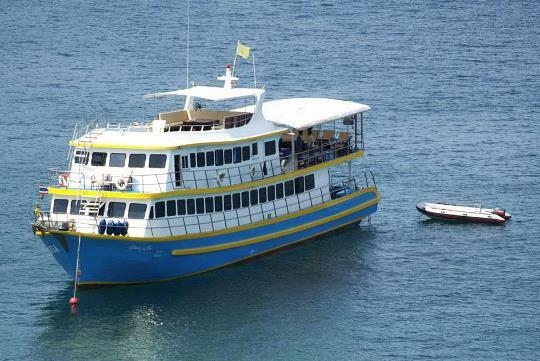 Whole boat charter rate (per night): 4 nights - US$ 3 929, 5 nights - US$ 3 772. Price excludes the use of Master cabins and divemasters service fees. For alternative trip prices, please check with us. There are 2 Master cabins with en-suite private bathrooms on the upper deck and 12 Standard double bed and twin bunk bed cabins on the main deck with shared bathrooms. The Master cabins are spacious and have additional lounge chairs, desks, and hardwood flooring. PADI certification courses include Advanced Open Water Diver, EANx, Rescue, Deep Diver and Underwater Digital Photography. Buffet-style meals are enjoyed in the open-air dining area of the upper deck, starting each morning with a pre-breakfast before the first dive. A cooked breakfast, lunch and dinner follow with an afternoon snack. The menu is varied and features a lot of Thai cuisine such as curries and noodle-based dishes. Thai and international meals, with 4 different dishes per sitting. Open-air buffet-style dining on the upper deck. Pre-breakfast, breakfast, lunch, dinner with snacks in between. Coffee, tea, drinking water, fruit, toast and biscuits are provided free of charge. Soft drinks and beers are also available for purchase. Vegetarians, halaal and special diets catered for. The dining service begins with dinner on the first evening of the liveaboard cruise. Operator rates their dining as very high! - safety is top but guest comfort is second. 12 litre aluminium scuba tanks with Int. and DIN valves. "Very Good. The cabins were clean and comfortable. The restrooms were shared and could have been kept cleaner but OK. The staff were excellent, helpful, and knowledgeable. both boat staff and PADI instructors . The students were also helpful.